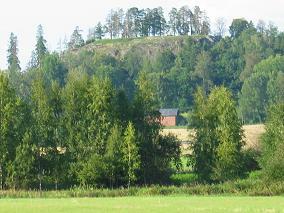 Notes: Hakoinen Castle (Hakoisten linnavuori in Finnish) are the ruins of a fortification on a hill in Janakkala, Finland. Dated medieval, the fortification was situated on a very steep rock by lake Kernaala (Kernaalanjarvi) reminiscent of a hill fort tradition. The top of the rock is 63 metres above the water level in the lake. Today very little remains of the castle. Equally little is known about its origins. One postulation is that it was built by the Swedes as their original stronghold in the medieval Hame area. Eventually Hakoinen was left out of use. Some activity seems to have remained there until the 1380s. The castle rock was later a part of a large estate belonging to the bailiff of Hame Castle. According to excavations, the castle was divided into two parts. Lower defensive constructions were mostly made of wood. Constructions on the rock were made of bricks and rocks. The castle probably had one tower. The site has only been excavated in the early 20th century.